A Pathfinder Society Scenario designed for Tier 5 characters. One of the hosts of Heaven, the archon Zepha, has sent a vision to you asking for aid. One the mainland, Abyssal monstrosities rise in the cursed Kaimuko Wood. The Pathfinder Society has proven a stalwart ally against these vile creatures in the past, but a greater force stirs. Now, a tear in reality is allowing more of them to slip through. Team up with an elite tengu mercenary band to drive these horrors back to the pits they crawled out of and slam the door behind them! 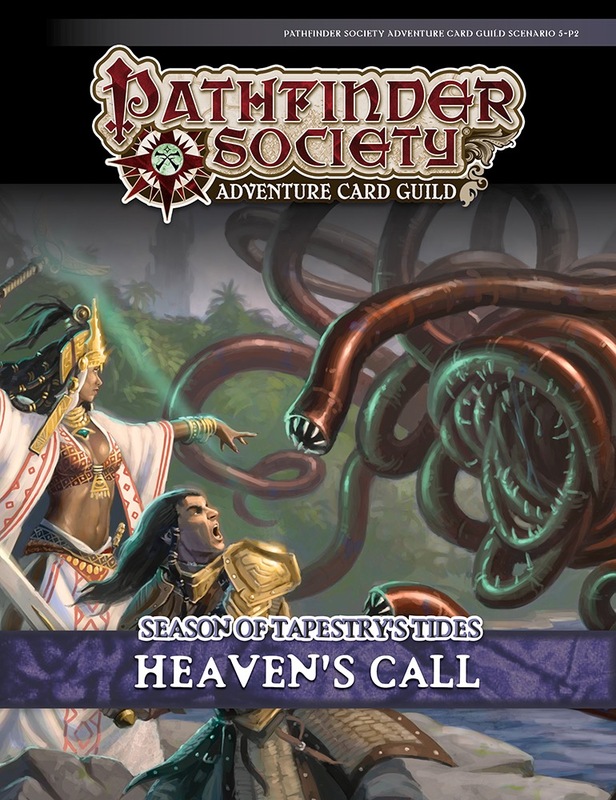 This Pathfinder Society Adventure Card Guild scenario bundle contains a bonus scenario for the Season of Tapestry's Tides and a Chronicle sheet for players to keep track of their progress. These scenarios require the Skull and Shackles Base Set as well as the Raiders of the Fever Sea, Tempest Rising, Island of Empty Eyes, and The Price of Infamy Adventure Decks. Groups of 5 or 6 players also require the Skull and Shackles Character Add-On Deck. 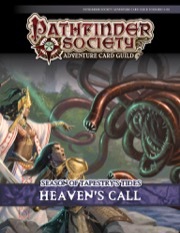 Sign in to start a discussion about Pathfinder Society Adventure Card Guild #5-P2: Heaven's Call PDF!